Under physiological conditions, the immune system successfully protects us from infections and cancer – a process that normally takes place without us even noticing it. Only when this system is disturbed, pathological processes such as infections and cancer, but also allergies, autoimmune diseases or chronic inflammatory diseases can occur. It is therefore essential to understand the function of the immune system in order to avoid or to correct these disturbances. The immune system is one of the largest organs in our body. It consists of many different components, which are distributed throughout the body. The cellular components of the immune system are mostly mobile and can change their activities according to their current location. In addition, these mobile cells interact with and influence each other in a dynamic fashion. To study such a complicated system it is first important to understand the regulation and function of its individual cells. We are therefore focusing our work on the regulation of Natural Killer (NK) cells. These innate lymphoid cells are important for early and effective immune reactions against viral infections and cancer. In addition, the activities of NK cells are important for shaping effective adaptive immune responses. Natural Killer (NK) cells represent a subset of lymphocytes that can kill tumor and virally infected cells without prior sensitization, a process called natural killing. They can also regulate immune responses by the secretion of cytokines such as interferon-gamma (IFN-gamma), tumor necrosis factor (TNF-alpha), and granulocyte/macrophage colony-stimulating factor (GM-CSF). 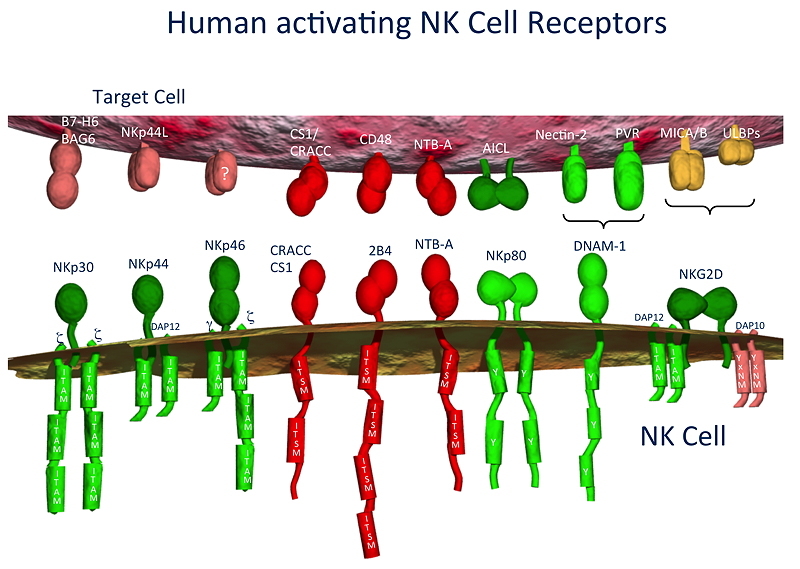 The activity of NK cells is controlled by a balance of positive and negative signals that NK cells receive through different surface receptors. The protection of normal, healthy cells from natural killing is assured by inhibitory receptors, most of which are specific for major histocompatibility complex (MHC) class I molecules. Engagement of inhibitory receptors by MHC class I on target cells blocks early activation signals. Therefore, cells that lose MHC class I expression and/or up-regulate ligands for activating NK cell receptors, a condition found on some tumor cells and upon infection by some viruses, are killed by NK cells. The research topic ‘Immunoregulation’ aims to understand the regulation of NK cells on a molecular level. We apply modern analytical methods to study human NK cells and how the activity of these cells is regulated through signals by different cell surface receptors. The activity of the immune system can be modulated by occupational-relevant factors such as stress, exposure to chemicals or aging. This may result in weakened immune responses and has important consequences for the health and the productivity of the working individual. It is, therefore, important to investigate the relationships between work and the immune system. We study how the immune system is influenced by different factors in order to identify important modulators. The junior research group ‘Neuroimmunology’ examines the interaction between the central nervous system and the immune system. Our aim is to analyze the mechanisms of how neurotransmitters act in the periphery of the body and affect our immune system. With this knowledge, for example, stress-related illnesses could be proactively prevented. The ‘Chronobiology’ research topic focused on the control of circadian and ultradian physiological rhythms, in particular the disturbances of these rhythms due to night work and to environmental influences under the aspect of performance, mood and health.